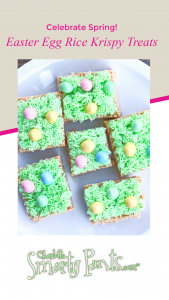 With Easter right around the corner, these cute Easter Egg Rice Krispy Treats are perfect for a spring party or an Easter brunch. The best part is that your kids can even help make them! We love making Rice Krispy treats around here because they are just so easy! Buy a box of Rice Krispies, grab some butter and a bag of mini-marshmallows, and you are on your way to sweet dessert heaven. 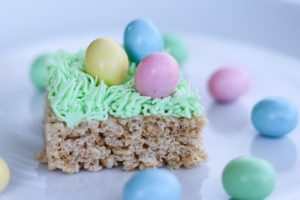 Rice Krispy treats are so easy to make and they can be easily transformed to celebrate any holiday. 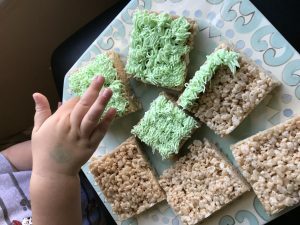 To celebrate spring, we made some buttercream frosting, dyed it green, and decorated our Rice Krispy squares to look like pretty spring grass. For the finishing touch, add some chocolate Easter eggs. My kids LOVED adding the eggs to our cute little squares. Melt 3 tablespoons butter, add 10 ounce mini marshmallows and stir until melted. Add 6 cups of rice krispies and stir to coat. Press into a greased 9×13 pan and let cool. Cut into squares and prepare frosting. Combine ½ cup softened butter, ½ cup shortening, and 1 teaspoon vanilla extract. Mix on medium in a stand mixer for 3 to 4 minutes. Add 4 cups of powdered sugar – one cup at a time. After all the powdered sugar has been added, add 1 to 2 tablespoons milk or cream until your frosting is at your desired consistency. You want the frosting to be stiff enough to stand up and look like grass when you pipe it out. After adding the milk, add the green food dye. I like the grass for this project to look springy! A pastel green tone works great. To make the grass, you will need a piping bag, a coupler, and Wilton decorating tip #233. I love this tip! It is very forgiving – it’s hard to mess up grass, I promise. Even my kids can help with the grass-making. My pro-tip for making grass is to go fast and don’t overthink it. Grass is grass. 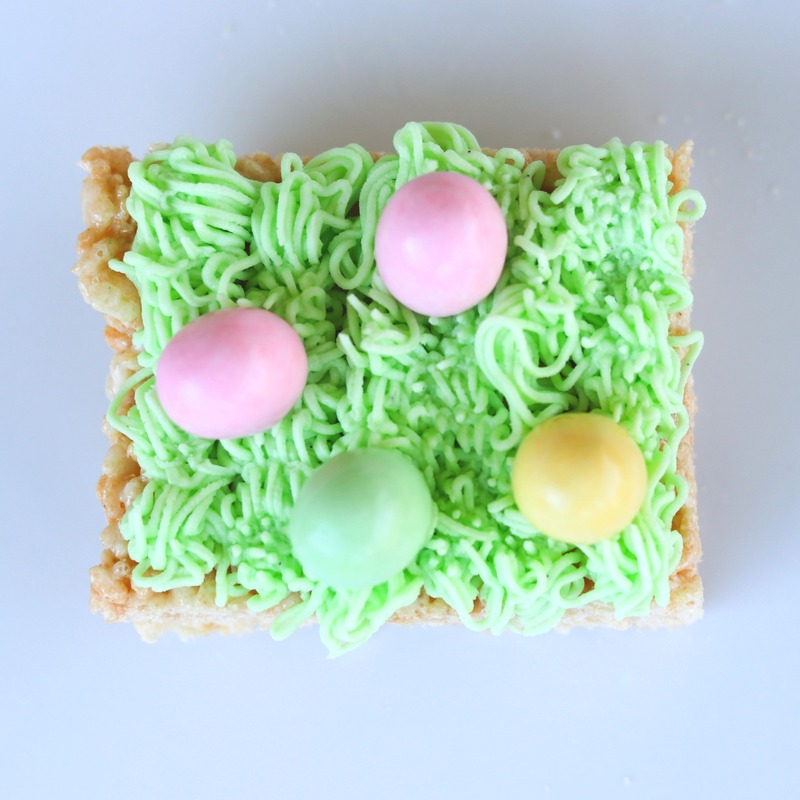 Make quick little movements and you will have your rice krispy square covered with pretty grass in no time. To Finish Your Easter Egg Rice Krispy Treat … place a few chocolate covered eggs on top! So pretty. Very delicious. Happy Easter!